Live sustainably, eat well, and support local agriculture by shopping for produce that’s grown right in your own community. There are many ways you can support local agriculture and promote sustainability within your community. In fact, buying organically-grown local produce is one of the best ways to live a sustainable lifestyle. Family-operated farms have been at the heart of American life since the nation’s birth. Live sustainably, eat well, and support local agriculture by shopping for produce that’s grown right in your own community. If you haven’t tried it already, shopping at farmer’s markets offers an incredible experience. Since most farmer’s markets are held outside, they are typically open from early spring and into late fall. 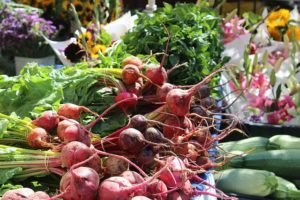 Whether you live in the city or in the country, there is a local farmer’s market that is close to your home or workplace. When shopping at your farmer’s market, you get to meet the people who grow and harvest the food that you eat. Farmers and their staff will be happy to answer any questions you have about their produce. Many farmers have volunteer positions available at their farmer’s market stand. Finding ways to help out is a great way to connect to local farms. If you’re interested in a hands-on approach to sustainable living, ask people working the stands at your local farmer’s market. If you’d like to help out with the overall operations of your farmer’s market, ask about volunteer opportunities at the information stand. Eating local also means eating seasonally. When purchasing produce from CSAs and farmer’s markets, you’re buying what is currently being harvested on local farms. This means your eating vegetables and fruits when they’re at their peak ripeness and reaping the benefits of their nutrients. When buying from a CSA that supports hydroponically-grown produce, you’re able to buy the freshest, most nutrient-rich produce all throughout the year. Hydroponic systems allow farmers to grow great-tasting produce no matter how hot or cold it is outside. Get the best produce from your local farmers to live a healthy, wholesome life! This entry was posted on Friday, May 25th, 2018 at 10:38 am. Both comments and pings are currently closed.